OMEGA’s conductivity level switches offer a wide range of customized options to meet any application’s needs. They are designed to control the level of all conductive mediums, offering up to 5 different points of level control. Models are available with fixed rigid rods, with removable rigid rods, or with pendular electrodes attached to the housing with cables. These switches suit applications involving both alarm point detection and on/off pump valve control. Installation is easy and operation is maintenance-free. The probes work through the variation of the electrical resistance between the reference electrode and the level-control electrode. Conductivity level switches detect the level resistance when their electrodes are covered by the medium. An electrically conductive tank wall can be used as the reference electrode. If the tank is made of plastic, concrete, or any other nonconductive material, an additional electrode is required as a reference. The LVCF switches can accommodate up to five 316 SS fixed rods for 5 different levels of control. The rods are isolated with a TFE bushing and can be coated with ECTFE/ETFE when the probe is used with aggressive or sticky media that cause buildup. The user can easily modify operating levels in the tank by cutting the length of the electrodes. The LVCF switches are rugged and compact and have no moving parts. This makes them reliable for controlling conductive media as well as for high-pressure applications. LVCF models are compatible with LVCN-200 Series controllers only. The LVCR models offer the same features as the LVCF, plus removable 316 SS threaded rods that make it possible to switch the rods. Rods can be ordered separately in longer length and can then be custom cut. Removable rods make the system more versatile, easier to handle, and more forgiving if the rod’s length is cut incorrectly. LVCR models are compatible with LVCN-200 Series controllers only. Along with the same features as the rigid rod probes, LVCP pendular probes can accommodate up to 5 model CLE-P electrodes. The LVCP probes are ideal for deep measurements in wells or large tanks where long rods would be impractical, but they work equally well for shorter-length applications. The electrodes are suspended from PVC cables that allow for longer lengths, as well as for different applications and installations. LVCP models are compatible with LVCN-200 controllers. The electrode model CLE-P is the simplest version of all conductivity probes. A small polypropylene enclosure houses a 316 SS rod that is attached to a PVC cable. This option eliminates the need for a process connection. 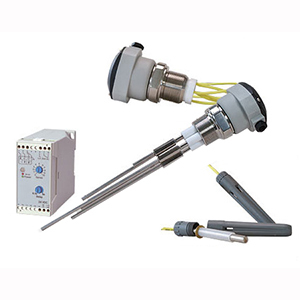 LVCN-200 Series conductive liquid on/off level controllers are used to power all level probes. The LVCN- 200 models are electronically controlled devices that open and close an electrical contact to effect the operation of other devices in the same, or another, electrical circuit. The LVCN-201/202 models can control the differential of minimum and maximum level, with an adjustment for sensitivity. The relay has 1 reverse SPDT contact. The LVCN-203/204 models control 2 independent levels and 2 reverse SPDT contacts. They also include a sensitivity adjustment. The LVCN-200 Series is designed so that multiple units can be used in combination to provide a variety of control functions, including multiple alarms and on/off control for alternating pumps. Both models are available with DIN rail sockets or with screws. For custom versions consult Omega Flow Engineering for quote. Additional Process Connections are available; consult Omega Flow Engineering for availability and quote.